I was sipping coffee on my early morning commute when a car swerved in front of me. I slammed on the brakes and now my blouse looks like a Jackson Pollock painting. We’ve all been there. We’ve all done that. Now how do we express this unfortunate moment in such an abbreviated way without sounding erratic or dull as dishwater? Whether it’s talking about a moment in time, captioning a picture, or sharing an article, how can I get my thoughts into 140 characters or less? Find your voice. Inject your personality into your tweets, use your own language, and for professional reasons, shape it for a business environment. That doesn’t mean you can’t be casual, comical, or conversational. It doesn’t mean your humor can’t be cynical or sarcastic. I just don’t recommend you be crude, racist, sexist, or confrontational with your followers. Consistency in your voice is the key, so if you are moody, remember that is going to be reflected in your tweets. Use a character counter. When I am writing tweets, I sometimes use an online character counter during the writing process to help me save time. A good one is http://www.lettercount.com. State your point first and then if you have room, state the situation. You can be creative without being too descriptive. Remember your audience. It’s o.k. to share your interest, but if you talk all day about lap swimming, your followers may not pay attention to you. Tweet to entertain, problem solve, share an article or cool experience, or to humor. Base tweets off topics related to your bio or profession. I don’t recommend constantly posting random thoughts unless you want to sound like Alan Garner ‏@AIanHangover. Practice tweeting with friends. It may take a while to get used to Twitter so don’t give up the ship if you feel like you’re not getting it. Follow friends and start conversing with people you know to help you get comfortable. Use hashtags. They categorize content by topic so people with similar interest will find your tweet. Hashtags will also help increase page traffic and followers. You can also use words or phrases that identify a situation and be humorous, like in my tweet above. 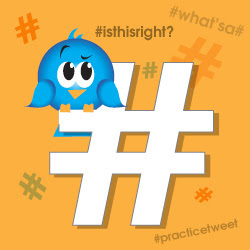 To help save time, create a list of hashtags that you can pull from and occasionally refresh that list. I have a list for personal and professional tweets. Finally, don’t beat yourself up about making a mistake. Everyone makes mistakes…especially when we are busy. As quickly as a mistake can be made on Twitter, it can be resolved. We are a community of real people behind these Twitter handles and don’t sweat – we’re all dealing with learning curves in technology and new devices. It’s been years since I joined Twitter, but I still get excited when I get new followers. Especially when they are people I look up to professionally. My professional focus with Twitter is to interact so my personal style is casual and conversational and I love to share cool visuals I create or find on the web. If you are on Twitter or would like to get a professional profile created for you or your business, email me at ahuebner@powerhouseplanning.com and/or follow me @AmieDesigns. If you reach out to me, I will be happy to help answer your questions about your personal profile. Of course, I also like to talk about how the team at Powerhouse Planning can help your business with your social media marketing needs….and if you get me started, I love to talk about sailboats (just in case you do, too).